The South-West region of England has long been a popular holiday destination, not least because of its outstanding summer climate. South West is rated 4.6 out of 5 based on 38 verified reviews from YGT customers. They played and stayed (we even checked they signed their scorecards). With the country’s most astounding coastline, the sandy beaches and charming fishing villages make Devon and Cornwall spectacular places to visit. It is here that golfing visitors will be delighted by superb destinations like St Mellion, Saunton Sands and the luxurious Bovey Castle. The great diversity includes rugged coastal golf courses, traditional private hotels and purpose-built resorts with spa’s, making it clear that the trip to the South-West should satisfy all demands. Slightly more accessible for most travellers is the resort town of Bournemouth, which sits proudly on the famous Dorset coastline above some 7 miles of sandy beaches. Bournemouth is also blessed with an array of fine golf courses, including a good range of luscious parkland and more undiluted heathland venues. This diversity, in addition to the legendary atmosphere, makes it a fantastic place for a golf tour, so all that’s left is to choose your favourite hotel. 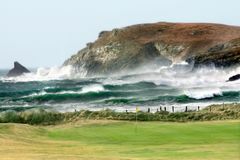 The South-West is home to a terrific array of golfing delights, and is well worth the trip to experience some genuine golfing treats.